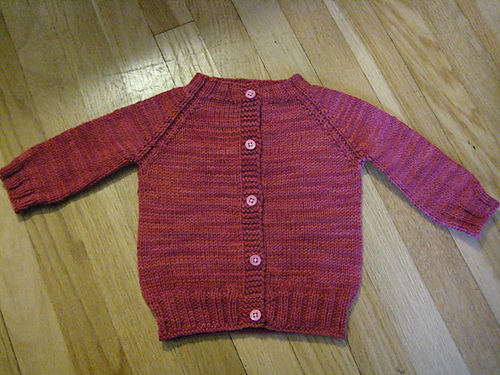 Baby girl’s cardigan. – Carbs & Fiber. I made this sweater over the course of a few months for a dear friend’s first baby. I knew she was having a little girl, so I wanted it to be girly-ish but not crazily so. 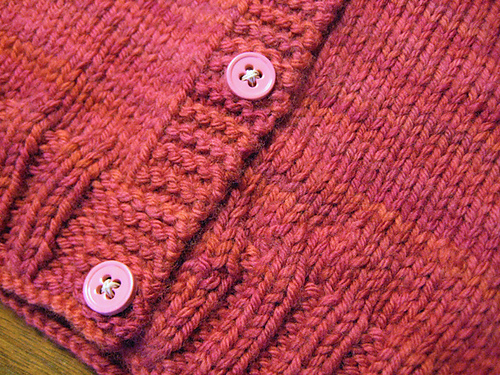 I liked the Knit Picks Swish Tonal yarn in Summer Blooms. It’s pink, but there’s some orange in there too. So it’s bright and fun and happy and just the right amount of girly. I used pink buttons from a large bag of assorted buttons. I thought they were fun without being too matchy-match. The pattern is the Top Down Raglan Sweater by Carole Barenys and it’s available free online. I was intimidated by sweaters at first but honestly? A top-down raglan is dead easy, and if you’re not ready to tackle sleeves on DPNs you can make a perfectly good short-sleeved sweater. 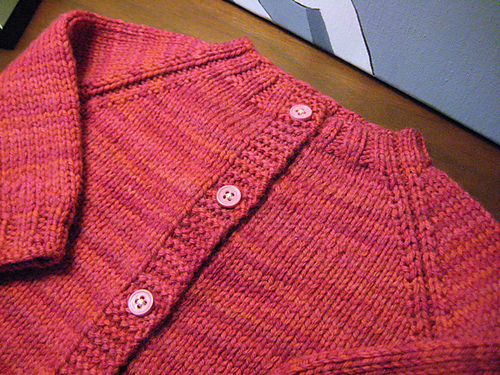 Making a tiny version of a sweater is good practice for an adult-sized version, too. The wool I used is machine-washable; I washed it and pinned it out to reshape it just so as it was a gift and I wanted it to look nice when it was opened. Next Quick post: Baked rigatoni. It’s very cute and I like the yarn, those orange stripes make it more fun than if it were all pink.